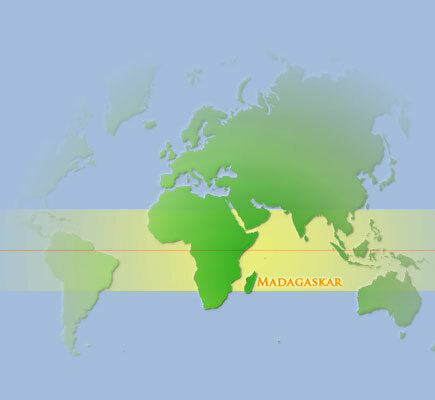 Madagascar is an island nation in the Indian Ocean off the southeastern coast of Africa. The island is the fourth-largest island in the world, and gives home to 5% of the world's plant and animal species, of which more than 80% are endemic to Madagascar. The official languages are French (due to the French colonial administration during 1895-1960) and Malagasy. Most people in Madagascar are rather poor and live on agriculture and fishing. Madagascar is the world's largest producer of vanilla. Unfortunately extensive deforestation has taken place in many places of the country. The result is severe erosion which leads to high sedimentation to the western rivers. The main parts of the tropical rainforest in the eastern country has disappeared. 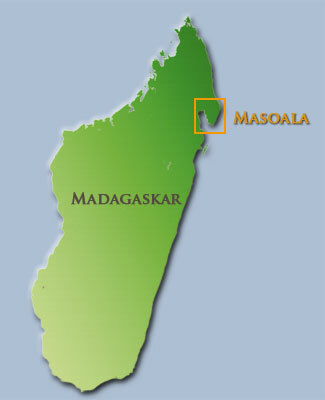 The Masoala peninsula is one of the largest remaining regions covered with rainforest. 1997 the government decided to potect the whole peninsula. 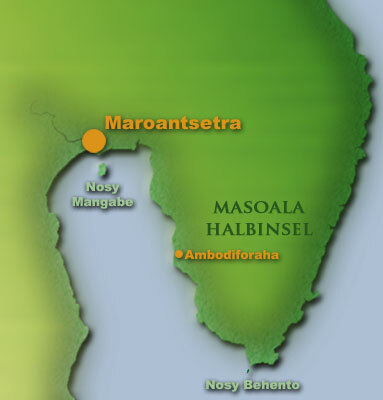 The Masoala National Park contains 2300 km2 rainforest and additionly the completely with rainforest covered island Nosy Mangabe (5,2 km2 ) in the Bay of Antongil. The protected areas also include 100 km2 of marine parks. The biggest one is located at the far south of the peninsula where the small paradise-like island Nosy Behento lies. These protected areas can only be reached by boat. The whole peninsula is exceptionally wet with frequent rainfalls. The driest months are september to november. There are several lodges on the peninsula and some small campsites. All visits to the park must be accompanied by an official park-approved guide. A journey to the Masoala National Park usally begins in Maroantsetra, which can be reached by plane. To see the route of my trip in 2005 place the cursor over the image on the left. I mainly lived in the very small village of Ambodiforaha which is a great base for trekkings into the primary rainforest as well. Located at the far south oft the peninsula still stands an old and abandoned lighthouse that was built during the French occupation. The view from the top of this lighthouse over the Indian Ocean and the Masoala peninsula is really overwhelming - provided it does not rain for a change.